Born to William and Madalena [Aagaard] Fristad on December 6, 1907, Palma was one of four children born to the couple and included brothers Gustav and Grant and sister Margaret. Palma attended rural school in Brown Butte District northwest of Mandan and subsequently finished Mandan High School. Ms. Fristad attended Valley City State Teachers College (now Valley City State University) where she trained as a teacher. Upon graduation, she taught at her home school, and at school districts at both Hebron and Wing, ND. An arthritic condition at an early age forced her to give up her teaching career in 1943. Undaunted by her handicap, Palma took a job at the local newspaper, the Mandan Daily Pioneer, serving in various capacities. An avid reader, she later became interested in local history. �She compiled a significant database of information, decades before the advent of the personal computer. 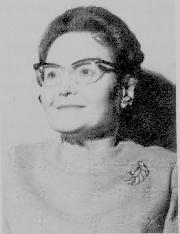 �As part of Mandan's 75th Jubilee in the year 1956, she wrote a series of articles which were published in the Mandan Daily Pioneer that year. �In 1970, she assembled the articles and published the compilation as a book Historic Mandan and Morton County.��She also wrote a history booklet of the First Lutheran Church and a poetry booklet. Despite her physical handicap, Palma remained active in community affairs and First Lutheran Church and was Mandan's Ourstanding Handicapped Citizen in 1963. A leader in the local American Legion Auxiliary, she served at its president during 1954-1955. Palma was instrumental in coordinating the Veterans Memorial Wall at the County Courthouse in 1955 to memorialize the names of all from Morton County who have given their lives during military service. She also spearheaded the project to plant the Theordore Roosevelt Centennial Memorial Elms on the Courthouse lawn in 1958. In 1973, Palma was among the organizers of the Morton County Historical Society. 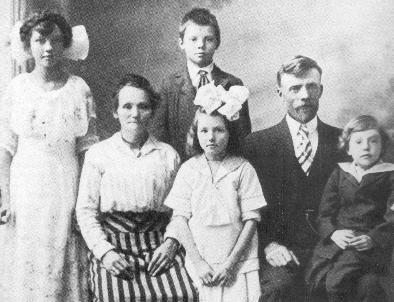 Shortly before her death, Palma prepared a sample history of her own family which was distributed as a template for individuals submitting family histories for publication in the Morton County Historical Society's Morton Prairie Roots history book. These books were one of the major projects undertaken in 1976 as part of the USA's bicentennial celebration. Although often in a wheelchair, Palma remained in contact with from her downtown Mandan apartment. With a telephone by her side and visits of friends and neighbors, she kept informed of current events. Palma Fristad died on December 6, 1974 on her sixty-seventh birthday. Her brother Gustav Fristad died six days earlier. Her sister Margaret (Mrs. Lloyd Peterson of Sun City, CA) also died earlier that year. She is buried beside her parents in Union Cemetery, Mandan.